He had a great influence on me and left a lot of teachings behind. He pursued the way of the sword just like how I want; sincerely and humbly. He wanted to open up the door of tradition to everyone so that not only martial artists understand the beauty of kendo but everyone. He wanted to see the new kendo world just like I do too. He started kendo when he was 55. He always wanted to do kendo but never actually got into action. He was always an observer of his son in competition or shiai. As all the other beginners, he started learning kihon. However, there was no such class for adult beginners so he had to go to a normal class where all the sensei put men on and trained with their students. Basically he was left alone at dojo. Several teachers came to him during class and told him what to do. However, each sensei told him a different thing so he was so confused. He came home and asked his son what happened at dojo so his son told him what he should have done with his basics or kihon. His son was his personal tutor. He never stopped training kendo unless he was extremely sick or it was physically impossible to train due to his age. After about 14 years of training, he became 5th dan before his son. In Japan, if you are over certain age, the number of training years between one grade to another becomes half. Not only in dojo but also outside dojo, he studied a lot. He read many articles about kendo and many books about kendo. He just read and read. When he was 60 years old, he found that he had a tumour at the back of his spleen. Apparently it is a very difficult position to operate. Luckily he got the tumour out. He taught me the fear of death. If the operation went wrong he could have died. I still remember how fearful it was. He taught me how fearful death was. On the Charismas day, 2006, 12 years after the tumor operation, he found that he had a lung cancer. It was not only lung cancer but the cancer was in his spine going to the neck. He was diagnosed as a terminal cancer and would live another 3-6 months. 2007 was the year he could challenge his 6th dan. His family decided not to tell him about the expected length of his life because he wanted to challenge his 6th dan so badly. The family did not want to disappoint him. In Japan, the family can still decide whether or not the patient should know about his sickness, especially if it is related to his life. Even though he knew he had a cancer in his lungs and spine, he did not give up. All of the sudden he was unable to walk. It was probably the side effect of the anticancer drugs he was taking. Instead of blaming on the drugs, he decided to develop the leg muscles. He started exercising in bed to build muscles. He even tried to develop the abs as well because he thought it would help him walk again and do kendo. You know what? He started walking again. And he started to do empty cuts or suburi with a short bamboo sword or shinai. His mind was set for his 6th dan grading and going to dojo. He kept telling his family and his teacher who came once a week to see him that he would be standing in dojo fairly soon. That was 2 months past his life expectancy. His tenacity of wanting to do kendo again kept him going only so much. Finally, he collapsed. His wife could not get him up. She had to call for help. This was the last time he could ever get up. On the 25th of November, he passed away. He was 72. His passion and love towards kendo influenced a lot of people, even people in some different continents. He even proved that kendo is something we could do as long as our lives go on. 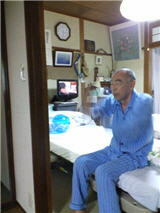 He even proved that if we do not give up, we can do kendo regardless of our age. Even though not many people know about him as a kendoist and he did not start kendo until 55 years old, he was indeed a pursuer of the way of the sword. Dad, rest in peace. You showed me the fear of the death and how to live without giving up. You never gave up living. You told me how to live the moment. Thank you for your teachings!